Home > Win 1-of-2 Family Passes to Sovereign Hills’ Christmas in July! Get a chance to win tickets to the event at Victoria and Christmas-themed hampers priced at $177! 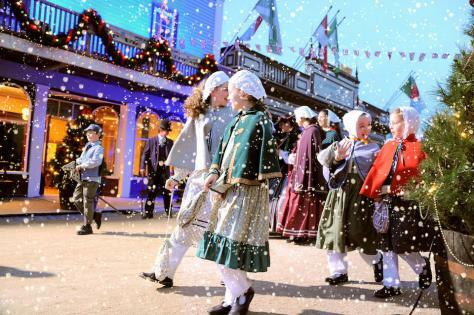 With a full day of fun and family activities topped off by our magical Wonderlights show, the whole family will love Christmas in July at Sovereign Hill. During the day, Sovereign Hill will ring to the tune of traditional carols, with Christmas trees and colourful decorations lining Main Street. ‘Hands-on' activities for children, a full theatre program, faux snow falls and delicious treats will bring Christmas cheer to all. By night, as the sun sets and the snowflakes fall, Main Street will be transformed by sparkling grand-scale images and bright Christmas Wonderlights dancing along its familiar façades. Sovereign Hill is a tourist attraction based in Victoria (90 mins from Melbourne) and they are once again staging their annual Christmas in July event from Saturday 27th June – Sunday 12th July, 2015). Following on from the enormous success of last year’s event, Sovereign Hill will once again be transformed into a dazzling Night Spectacular with large-scale projections lighting up the outdoor museum. Visitors will be swept up in the magic of Christmas, and astounded by incredible light projections, set to rival events like White Night Melbourne and Vivid Sydney! Get a chance to win these amazing prizes by joining below! Win 1-of-2 Family Passes to Sovereign Hills' Christmas in July!